My Life in the Shadow of The Twilight Zone: TZ News Flash: More color bobbleheads Available for Pre-order! TZ News Flash: More color bobbleheads Available for Pre-order! I previously reported that Bif Bang Pow! is releasing (very limited) color versions of their first three Twilight Zone bobbleheads as San Diego Comic Con exclusives. 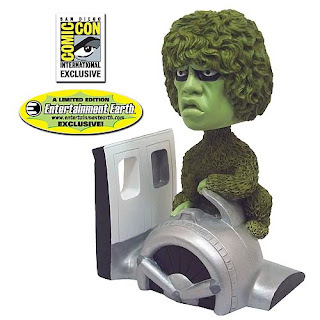 They've now revealed that color versions of their next two bobbleheads (The Gremlin and The Kanamit, the regular versions of which are scheduled for release in June) will also be available --- in similarly limited numbers --- at SDCC. They're also taking pre-orders for folks who can't make it to San Diego over at Entertainment Earth. $19.99, limited to 504 pieces. Pre-order limit 2. $14.99, limited to 504 pieces. Pre-order limit 2. As I stated in my previous report, I have serious doubts that I'll be able to get these, which just breaks my heart. The black-and white non-exclusive versions of these bobbleheads sell out regularly (The first two, The Invader and The Mystic Seer, are currently available again after selling out twice, and Talky Tina is currently unavailable until July), so a low-numbered run of color variants will undoubtedly vanish quickly. 504 pieces??? And since I'm still basically broke after our recent move, I can't pre-order them right now. When Bif Bang Pow! 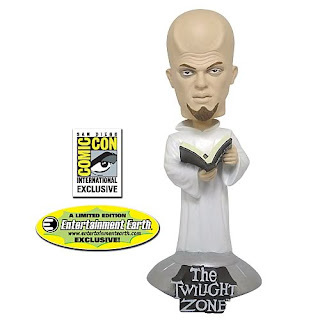 first announced that they'd be releasing Twilight Zone bobbleheads and action figures, I vowed to collect two of every single item they produced. Unless something changes in my financial picture (and fast)... well, I won't be able to do it. And the irony? By reporting on these limited exclusives, I'm (presumably) helping them sell out even faster. This is my life in the shadow of The Twilight Zone... sometimes irony's blade is soft and pliable, and other times it's razor sharp.